Good afternoon!! Hope you're enjoying your Easter Sunday. Bar-b-que is on the menu for later today, but for now, it's all about crafting with my bestie, Renate. :) Which takes me to my La-La Land Crafts post for today. As I was flipping through the stamps Luka with Truck caught my attention and right then I decided I wanted to use this cutie to make a boy card this time around. 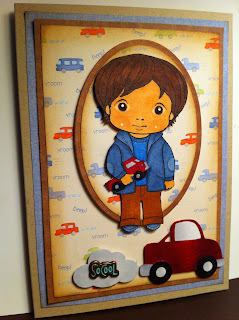 I paired him up with some cute automobile paper and found a Cuttlekid truck die that I colored with Copics to match the truck in his arms. I punched out a small cloud and colored it to make it look like smoke coming out from the exhaust. Renate shared her cute brads and I used So Cool for the center of the "smoke." Have to say I think this little boy is a cutie pie and can be colored to look like anyone's little boy. Don't forget to upload any of your La-La Land projects to the Customer Gallery. A winner will be chosen at the end of the month for a cool prize. Mahalo for stopping by today. Have a wonderful Easter Sunday! I really love that litte card down at the bottom and those papers are great! Terrific card Leanne!! Thank Goodness for Fireman Luka! Too many shoes? Not! Never! No way! Heartfelt Thanks from Fancy Marci!! Copic Blog Candy - NEW Winner!! Dress up Marci is Retro! Delivering Birthday Wishes & a Giveaway . . .
Would you like to WIN 12 COPIC MARKERS??!! Dress Up Marci...She's So Stylish!! Sittin' here thinking of you . . .